Joshua Lawrence, 1778-1843 The American Telescope, by a Clodhopper, of North Carolina. 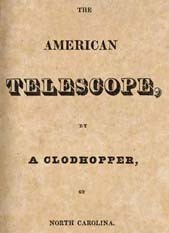 The American Telescope, by a Clodhopper, of North Carolina. Philadelphia: Printed for the author, 1825. Baptists -- Missions -- Finance. North Carolina -- Church history.